As the NCSM Annual Conference comes around again, I found myself studying the program as I planned some of my activities during the conference. I noticed immediately that there are a huge number of sessions devoted to coaching. I'm excited by the possibilities of mathematics coaching and by the growth I've seen in the supportive offerings for coaches at the annual conference. During my time as C1 Regional Director, I've devoted much of my effort at board meetings and events to the NCSM Coaching Committee. I did this because, initially, I was interested in coaching and saw what I thought was great potential in the practice. As I've delved deeply into the realm of mathematics coaching over the past three years, I've come to realize that mathematics coaching is, perhaps, the only way forward for professional learning in mathematics. The traditional model of PL must give way to a more blended model, involving periodic PL meetings sustained by intensive classroom coaching efforts. One resource that can help with this transition is NCSM's newest publication: NCSM Essential Actions: Coaching in Mathematics Education. I had the privilege to serve on the writing team and I can tell you that I am very excited for the release of this book. It's a view of mathematics coaching from the program level, meant to support teachers, coaches, administrators, and more on the journey to a robust, sustainable mathematics coaching program. So here we are. The end of the road. I close my term as C1 Regional Director at the Annual Conference in a few weeks. It has been an honor to serve in this capacity and I hope to continue to serve NCSM and its members in years to come. Thank you all very much. 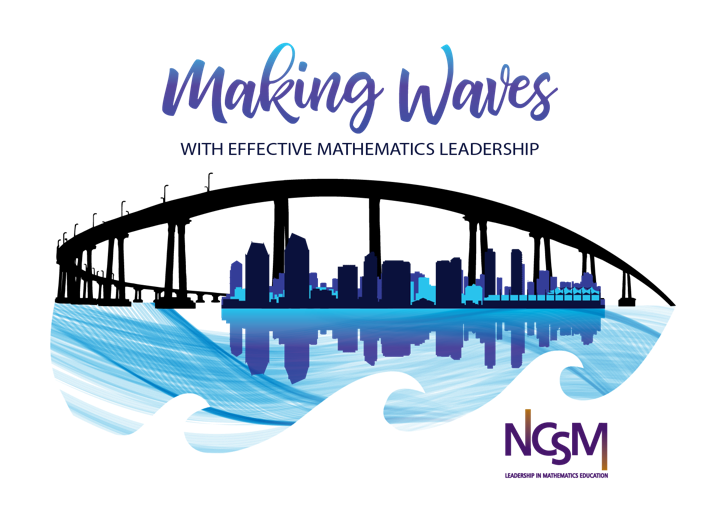 The NCSM Annual Conference, Making Waves with Effective Math Leadership, will be held in San Diego at the Marriott Marquis San Diego Marina Hotel from April 1-3, 2019. There is still time to register online with onsite registration beginning March 31. Be sure to sign up to volunteer as well. It is a wonderful way to network with colleagues and speakers and feel the energy of a national conference! Don't forget - our Central 1 Regional Caucus will be held during the Conference on April 2, from 3:30 - 4:15 in Pacific 25 in the conference hotel. Join your colleagues for networking and discussion.